I hear these words a lot: "I don't know how you do it." They are usually coming from well-meaning friends, sometimes from strangers, referring to the challenges of caring for a chronically ill child. Usually I smile and admit I don't know how I do it either. I just get up and do what has to be done to keep Bennett well. I don't know how I can do it. Not one more time. Not now. I just can't. 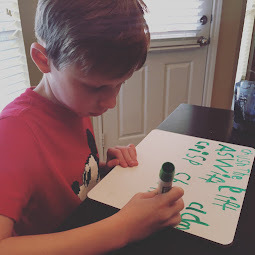 For weeks, we have been gearing up for Thursday, Bennett's 5th sigmoid dilation and his 7th hospitalization this year. The plan: stop his solid foods first thing Wednesday morning, give lots of Miralax and an enema before bed Wednesday night, stop fluids on Thursday morning, drive to Dallas shortly afterwards, undergo anesthesia for a 1:30 pm procedure and spend a night in the hospital to monitor. I had a really sweet friend reach out to me a few nights ago via Facebook with a sort of "welfare check." She hadn't heard much on the blog and wanted to make sure things were ok. I really appreciated her checking on me. Everything is very much ok. Kids are thriving in school. Now that Avonlea is getting bigger, I'm being able to pursue some new opportunities. My silence on the blog, however, has been somewhat by design. 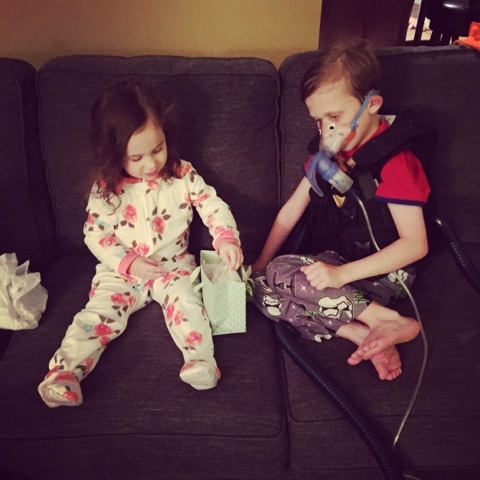 So far this year, Bennett's issues with CF have been really challenging. In January, he had a portion of his colon removed. 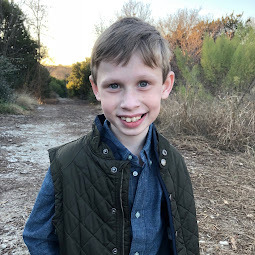 Nine months later, we are still undergoing procedures to address an intestinal stricture that may have been a complication from the January procedure. At times, the emotional "noise" that has come from all of that has been very loud. 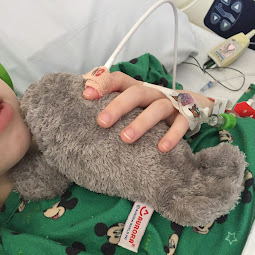 That's why I've chosen to be quiet on the blog during the non-hospital times. I've needed to turn my attention to everything else in life - anything else in life - other than CF. I began running the procedure through my head. "What about this?" "What about that?" I could tell that I was feeling like I'm running on fumes. I began to share with Brian, a close friend, my mom and my therapist that I was afraid I simply might not be able to do it next week. Each of them responded to my concerns with validation and support. What complicates this upcoming procedure is that the colon prep is more intense than usual...and that the success of the procedure is still a bit unknown. "Is it worth it?" I keep wondering. "Will it even matter? All that we have to go through - will it matter in the end??" We think this next time, this last of this batch of dilations, should be beneficial. But we still don't know whether or not it's going to last for the long-term. And we still don't know whether surgery is still in his future. Only time and a few more procedures will tell. In moments when I need to be fully engaged, I want to be unengaged. In moments when I need to be supportive of the process, I'm looking for ways to make the process easier on us. In moments when I need to be strong for Bennett, I can't find my strength. I shared my feelings with my therapist on Friday: "I don't think I can do this next procedure. I'm running on fumes. I'm afraid if something goes wrong with the procedure, I will be on empty and have nothing else to give. I'm afraid that's not what's best for Bennett." My therapist listened intently and then said, "I've walked with you through a lot of Bennett's challenges over the years. It sounds like this is not a good time to do the procedure. You must remember that Bennett depends on you. He doesn't have his own "car" - you carry him in yours. If your "car" is on empty, then Bennett goes no where." Her validation was important. I knew deep inside I didn't want to do the procedure next week. I knew I didn't feel like I was emotionally ready. But how could I cancel on Bennett? What would be the repercussions? Brian agreed that this procedure is not an emergency. We want to improve his quality of life. But, all things considered, he's doing well He hasn't been sick in a long time. He's happy. His teachers have accommodated at school for his bathroom issues. He can wait. So, what's my problem? Why not just call and cancel? I expressed my concerns during my therapy session, one of my favorite designated places to process my internal thoughts externally. "It sounds like you are trying to take care of the doctors...that you are really concerned with hurting Bennett's physicians' feelings," my therapist reflected for me. I acknowledged she was right. 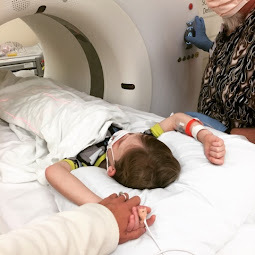 Although, I thought postponing the procedure was the right thing for our family and the right thing for Bennett (heaven forbid, the kid just needs a break), I couldn't get past the issue that my postponing the procedure would be a bother to Bennett's doctor, for whom I have the greatest respect and confidence. My therapist reminded me that Bennett's CF team is there to help us, not the other way around. They just want to help Bennett feel better and live life as fully as possible. As much as I identify myself as being a patient advocate at times, I find it interesting to be so afraid to postpone Bennett's procedure for fear of being seen as non-compliant. I want Bennett's doctors to take good care of him so we try to be respectful of their time and efforts. But, my therapist reminded me, that doesn't mean we have to undergo a procedure we aren't ready to undergo. Throughout our conversation, I was reminded in therapy the power I have as Bennett's mother. There are times when it's ok to say, "stop." It's ok to say, "we need to breathe." We need to go forward only when we are all feeling ready. It wouldn't be in the best interest of anyone for a mama's heart not be ready. I am Bennett's advocate. When I can't do it, he can't do it. Yesterday afternoon, I penned an email to Bennett's doctor. It felt empowering to write. So often, it feels like CF is in control. It felt good to remind myself that it is not. But what really meant a lot to me is hearing back from my doctor not too long after I sent the email with the words, "No problem. I understand. Let me know when you are ready to proceed..."
My doctor didn't need to write those two words: "I understand." But they felt really good to hear. CF doesn't care. CF doesn't understand. But humans do. And Bennett's doctors are humans. They get it. "I don't know how you do it," people say. "Sometimes...I simply don't," I will now respond.